Sales-wise not as successful as the original R1 combo but a fairly different drive which replaced the BU + KSS-190 introduced in 1987 for more "G" compound drive base, a newer 3x BSL motor unit with a cleaner mechanism layout, equivalent to that of the CDP-X779ES and CDP-X707ES players. This new mechanism allowed even better vibration control and damping and Accuphase, naturally, used it in its own units. The power-supply was upped and all boards upped and redone as well : the CDP-R1a wasn't a simple re-take with a redesigned front but a completely new development. The real sonic updates were however reserved for the DAS-R1a d/a unit. As for all of Sony's top units, the fit, finish, work on colors and textures is unbelievable and puts all other brands right next to the DIY amateurs - but you got to see and use them to fully grasp that element. Perhaps the near-identical looks were a mistake (market-wise) but this still is an excellent combo which was kept available along with the 1992/93 CDP-R10 and DAS-R10 for those who couldn't shed 2,000,000¥ for the latter. Although... at 700,000¥, the R1a combo wasn't exactly cheap either. Very successful however it was among japanese audio reviewers : two thirds of them had one as "reference" until the early days of SACD (and beyond). 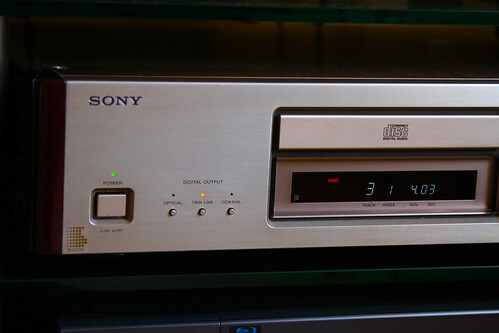 Unlike the CDP-R3 player, the R1a combo was vaguely exported outside Japan, much after its homeland launch. The exact production run should be around half of the original CDP-R1 / DAS-R1 : 650 combos made, tops. after a few delays on the dispatch front, will be hooking it up tonight and doing the A/B comparison against the CDP R3. Well after few days of listening I can report that the Sony CDP R1a and DAS R1a is simply sublime. It is better than the CDP R3 but in ways where the music tone is more full and rich. The detail is amazing but I am not saying sparking top end SACD detail or like many modern CD players available now that seem slanted in this direction. Have been spinning Bach Brandenburg Concertos by Karajan & Berlin Philharmoiker and Bernstien's Malher 5 Symphony by Deutsche Grammophon. The strings are so life like and hearing more the technique of the musicians playing is a fantastic revelation. Even Modern music like Dido's 'life for rent' the vocals are more present than the R3. Jazz has that depth and body between the Bass and drums giving a great platform for Mile Davis trumpet solo on 'Kind of Blue'. I m really talking about separation of the instruments is it strength. Owning this reference combo is a joy to use and I can only highly recommend it if you take the plunge. A good friend who owns a Sony SCD 1 came round and we ended up listening to some music over a glass of wine! He remarked in his own words that it outperforms the SCD 1 CD playback and has a character all of its own. The combo really requires good speaker cables, interconnects which is why I think I may need to upgrade from Chorus 2 and Epic speaker cables. TOSLINK is a must. So to end this mini review I still recommend the R3 as that first step into the world of Sony reference players but the combo R1a and DAS 1a is the ultimate. The difference in wine terms is first(Combo) and second(R3) growths, Bordeaux of course. I may look out for a DAS 1 with the S1 chips as Axel has, what does everyone think? Still looking for some amplifier advice as I am currently running the super TA F808es. The bi-directional Twin-Link does make the overall rendition much more coherent and properly "timed". Over a regular TOS(hiba) it is normal, but it does so over the 75 Ohm coaxial as well which would prove that two-way clocking is one of the crucial key. Keep the SOC-10 Twin Link cable safe - it would be difficult to find as spare part ! Thanks Axel, Yes the twin-link clock definitely has something to do with the reproduction of the sound. I remember reading an article from Gramphone.net that there was not much difference between the R1/DAS1 and the R1a/DAS 1a and proved to be a useless exercise trying to find any. But I can't comment. Managed also to get a 'NEW in a sealed box' spare KSS 151A on its way to me as I type, this was expensive! This combo is an original UK version, have the instructions, remote and original boxes.....one careful owner who went SACD and not used them since 2002! Great to hear you are enjoying it so much. Looking forward to the pictures! I think it will probably remain a dream for me to ever own this luscious combo. Still not exactly affordable stuff, even after all these years. I've been listening to an SCD-555ES (with Tentlabs mods) for the past year and a half or so, and while I enjoy its sound, I do feel a craving for the CDP-X777ES again, both in terms of sound and operation. How do you feel the CDP-R3 compares to a CDP-X777ES ? 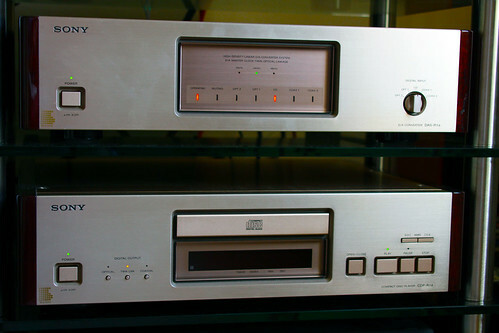 I am not sure how the x777es sounds Axel has a better opinion on this.....although I owned a x779 and that was very good so I guess its almost the same...On the combo R1a/DAS1a it took me three months to persuade the owner to sell it....even though he didn't use it! I completely missed this thread. Congratulations on this purchase, a really beautiful find. How does the performance compare to any other players you have owned besides the R3? I think that an investment in this combination will really pay off over time. 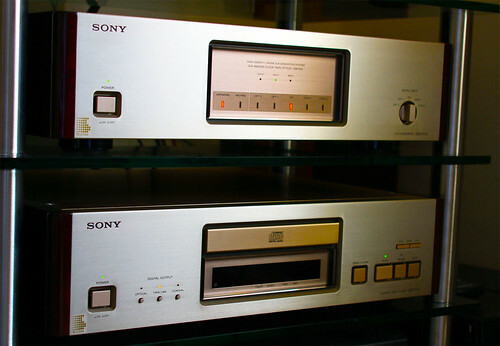 When you compare it to modern players there really is little difference and the Sony cd/dac is still up there with the best of the best....I think some people are slowly realising that they have been had in modern audio. mpd wrote: Well after few days of listening I can report that the Sony CDP R1a and DAS R1a is simply sublime. It is better than the CDP R3 but in ways where the music tone is more full and rich. The detail is amazing but I am not saying sparking top end SACD detail or like many modern CD players available now that seem slanted in this direction. Let me help you a little bit with your new amps choice. As you have purchsed the combo 1a you should get the new amp to benefit from the sound quality 100%. In my opinion you should go for the amps with XLR balanced inputs hich provides the shortest direct path for signal from D/A section to amplification. Your current amp TA-F808ES does not have XLRs. My proposition is to try Sony TA-FA7ES, TA-FA777ES as well as TA-E90ES/TA-N90ES. Also these amps sounds much better than your current TA-F808ES. However, it is quit difficult to recommend on which amp suits you because I have no idea about your speakers. Of course, to buy the match series you can go for TA-E1/TA-N1. But on my point of view these combo does not provide very good value/for money being overevaluated. Also you ca have a look at another producers like Pioneer Exclusive. Beautiful amp is Pioneer A-09: Pure class A amplification, golden connectors and, of course, XLR inputs. You will not be dissapointed with this amp which could be compared to a good tube amp in sound section. If you decide to sell your TA-F808ES please do not hesitate to contact me. Thanks for the advice will stay with SONY only, (building that vintage set) I really like the RCA sound and now have a chord signiture plus cable it sounds great. the TA F808ES is a great amp so I am not sure how great the improvement would be on the FA7ES as I have not heard one. My speakers 4x SONY SS A1L great speakers like the ROGERS LS3's - Anyone else.....AXEL? Been using by DASR1a now for a few weeks. It is great now that I have solved the annoying and hard to find dry joint problem. But the sound, Oh the sound is amazing. Really amazing. Real rock solid stereo image and clean highs. I've never heard a stereo image like it. Much much much better than I remember the DASR1 which had a rather odd DSP setup that made it sound rather hard on the treble. Directly through the onboard volume control on the N902 it is amazing, I've also tried the E88/N7 combo and you do get real bass out of it. Now I've got to find out which pre sounds best E900, E901, E88 with which power. I have a feeling that I am going to enjoy messing around with this. The bass is punchy but at the same time totally laid back. You can feel the bass through the floor with drum rolls or low plucked double bass notes but it isn't in your face, it is matter of factly reported to the listener. Well recorded material sounds amazing, poorly recorded material is shredded and totally laid bare. But at the same time the R1a is easy to live with as you just feel you are getting a faithful report, if something doesn't sound quite right it is usually pretty clear what the problem is over panned or to much balance to a close mike (split stereo location is easy to hear). BTW the R1a sounds dreadful with Sonos and also with up-sampling via my MACBookPro but sounds amazing at straight 44.1 kHz. Six out of the eight of the Stereo Sound reviewers (JP) used a DAS-R1a at home until the late 90s. And some even kept both ! stchedro wrote: Been using by DASR1a now for a few weeks. It is great now that I have solved the annoying and hard to find dry joint problem.